1. New tools that greatly improve the decision taking process. DoR® is a mathematical model that quantifies the level of risk on a daily, weekly or monthly basis -VaR or tracking error- that allows the investor to maximize his/her terminal wealth. You will decide what to buy or sell, as usual! DoR® indicates the optimal amount to invest, trade by trade! DoR® = risk management focused straightforwardly on improving the decision taking process. 2. 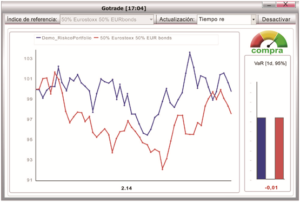 The “state-of-the-art” of investment management software in real time.